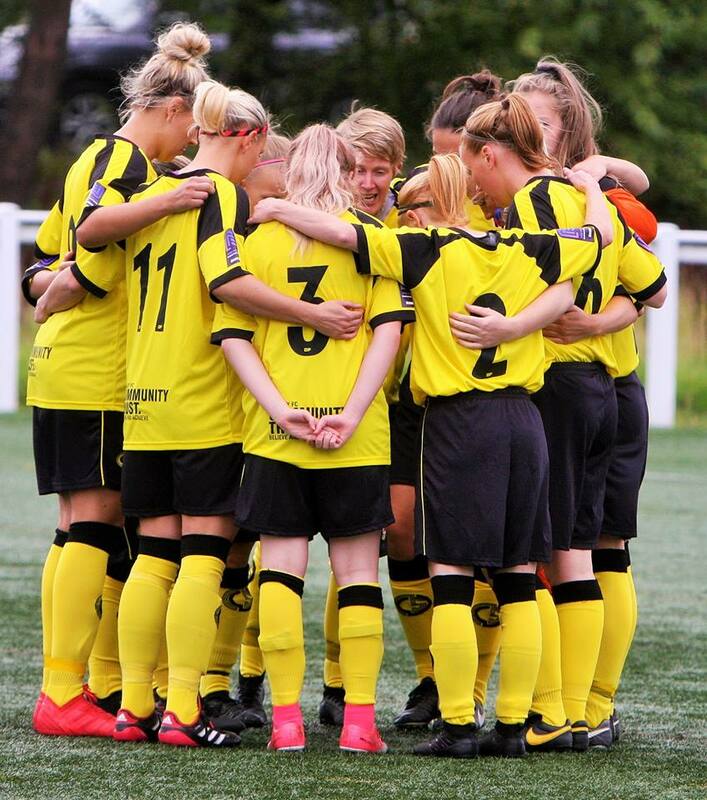 Chorley were looking to put their recent run of defeats behind them as they faced fellow mid-table outfit Leeds United Ladies. After an even first five minutes it was Leeds who put in the first serious attack, but the shot was well saved by Rachel Darbyshire. Good interplay between Vicky Coope and Rebecca Kemp resulted in a fine cross which just eluded the head of Abi Fenton. Leeds had plenty of pace up front and a dangerous move resulted in a good block by Jan Mitchell, then on 13 minutes Leeds broke the deadlock; a dangerous through ball caught the Chorley back line square and Holly Findlay delivered a pin point cross which resulted in a fine finish from Hannah Campbell. This setback seemed to galvanise Chorley and in a competitive midfield battle the visiting midfield of Laura Walker, Grace Vella and Katy Morris more than held their own as they worked hard to release the wide players Fenton and Kemp. Chances were few and far between with a well organised Leeds defence restricting Chorley to long range shots and any Leeds attacks being snuffed out by the Chorley back line. A surging run down the wing by Lisa Topping resulted her being unceremoniously flattened which drew the only yellow card of the game. With half time looming a high ball into the Chorley box caused a defensive mix up and the loose ball was despatched by Abby Parkin to give them a 2-0 half time lead. The second half started with Leeds doing most of the attacking and only some fine last-ditch tackles by Saskia Bowes and some super one on one saves by Darbyshire prevented Leeds from adding to their tally. A tactical change by Chorley pushed Topping further forward and a couple of attacking runs resulted in crosses but all were cleared by Leeds. Fresh legs for Leeds allowed them to maintain their tempo whereas Chorley tired late on. With 20 minutes to go a back pass was intercepted by Campbell who powered through and gave Darbyshire no chance. Late on Megan Searson drove through with purpose as Chorley desperately tried to find the elusive goal but all to no avail. It would have been easy for Chorley to lay down, but the spirited bunch battled on to the end and surely with this effort a change in fortune is close. Chorley: Darbyshire; Mitchell, Bowes, Searson, Topping; Fenton, Morris, Walker (c), Vella; Kemp, Coope. It was supposed to be the rearranged FA Women’s National League clash with local rivals Bolton Wanderersat Atherton Collieries’ Skuna Stadium, but with Bolton still in the SSE Women’s FA Cup, a fixture is yet to be scheduled.